Notes: Denmylne Castle, about a mile south-east of Newburgh, was the home for more than 250 years of the Balfour of Denmylne family, of which the two brothers, James (1600-1657), the annalist and Lyon King, and Andrew (1630-1694), founder of the Botanic Garden in Edinburgh, were the most distinguished members. 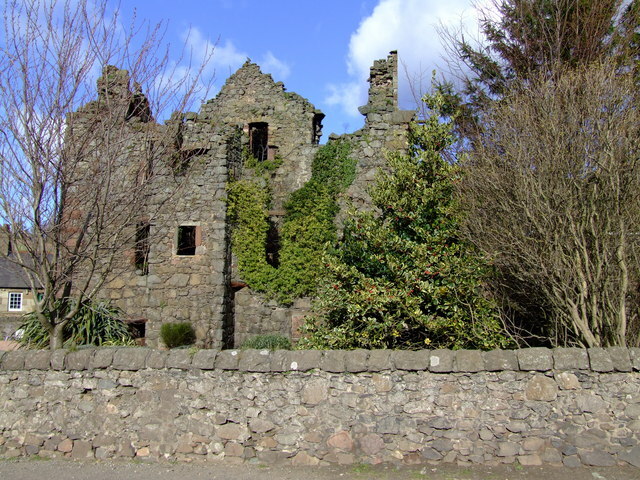 The Castle was abandoned in 1772 when the estate was sold, now stands within a 19th-century steading whose construction will have necessitated the removal of the Castle's subsidiary buildings. It been unroofed for at least 200 years and is in an increasingly dangerous state of disrepair. A lintel dated 1620 has been re-used in one of the steading's building.